Sleaford Town Reserves continue to set the pace in the Balcan Lighting Supplies Lincolnshire League, despite dropping their first league points of the season in the last game of 2015. The Eslaforde Park outfit opened their league campaign with eight straight wins before coming unstuck against champions Hykeham Town. Two Supplementary Cup defeats to Hykeham saw Sleaford bow out of the competition during the group stages. In Nathan Thompson and Jac Wright they have strikers who have found the back of the net on 24 occasions between them, but Sleaford have had 12 different scorers so far this term. Second-placed Wyberton closed the gap when they beat Horncastle Town 4-0. The villagers have now lost only once since October 17, conceding only three league goals so far. Lee Orrey is their top marksman with 11 goals from 15 games in all competitions. His former club Skegness Town occupy third, having scored 16 goals in their last four games. They have been knocked out of the Challenge Cup by Cleethorpes Town Development Squad, but they have a date with Epworth Town in the Lincolnshire FA Junior Cup quarter-finals. They sit on the shoulder of Wyberton in the league table on the same number of points, having played one game more, reflecting on the home defeat they suffered to bottom club Market Rasen Town in October. Fourth place is currently occupied by Brigg Town Reserves, who have played more than half their league games already. After a difficult start to the campaign as the league newboys, their fortunes have improved in recent weeks with only one league defeat in six. 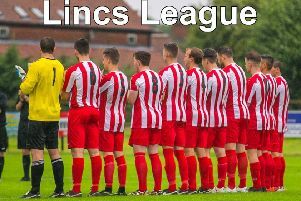 Fifth-placed Lincoln Railway AFC got off to a poor start, but Simon Mowbray’s 14 league goals from seven appearances have got the railmen’s season back on track. A total of 46 players have helped Cleethorpes Town Development Squad into the top half of the league table, who haven’t played a league game since their 3-1 win over Horncastle on Halloween. They have a Challenge Cup semi-final to look forward to and are also through to the last eight of the Supplementary Cup. Reigning champions Hykeham Town have already lost three times, as many league games as they lost in their entire title-winning season. New signing Chris Funnell has struck 15 times in all competitions this season. Eighth placed CGB Humbertherm started the season well, but no domestic victories since has seen them slip down the table. Under the new management of Gary Edgley and John Barker, Skegness United are yet to reach the heights of previous seasons, although they do have a Challenge Cup semi-final to look forward to. Horncastle Town have scored only four goals after eight league games. Richard Jackson has netted three of those and Carl Smith the other, but The Wongers have enjoyed more success during cup games. They have a home Supplementary Cup quarter-final against Wyberton or Cleethorpes Town Development Squad in February. Ruston Sports have been rebuilding their team this season. They bagged three points at Rasen Town in August, but have failed to register further league points since. Market Rasen Town occupy bottom spot following five consecutive league defeats. They do have the scalp of 2014 champions Skegness Town under their belts after a 3-2 success at Burgh Road, but this is their only highlight, having been knocked out of their three cup competitions.